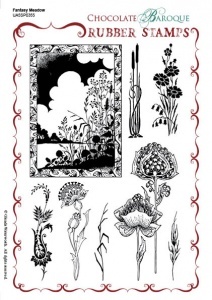 This rubber stamp set contains a series of stylised meadow plants,flowers and grasses and a wonderful silhouette landscape scene. Fabulous images that can be used alone or as a collection to create your own grassland project. I love the assortment of the large stamps and the smaller ones which are so versatile for different types and sizes of cards. I like to make all sizes of cards - not too keen on very large ones - and have started making smaller cards after some time away. These stamps will fit all of my needs! I have just received my stamps and haven't had a chance to use them. I just love the designs which remind me of the Art Deco/Art Nouveau era. This plate of stamps is stunning and ticks all my creative boxes. The meadow image is a versatile, stand alone image which could be a river bank or a hedgerow. The floral designs can be used for beautiful backgrounds but equally can be used alone in the 'less is more' creative style. Needless to say the stamps are manufactured to the highest standards.